The Science Effect: How Does Science Fiction Influence Public Perception of Science? Public health and biodefense policy expert Laura Kahn has written an article in the Bulletin of Atomic Scientists that argues that science fiction influences public opinion of science and scientists and can ultimately lead to changes in science policy. Her examples come from the life sciences in science fiction: neurophysiological experimentation in Mary Shelley's Frankenstein, vivisection in HG Wells' The Island of Doctor Moreau, and genetic engineering in Michael Crichton's Jurassic Park. And so, instead of science affecting culture (neurophysiology becomes the timelessFrankenstein), the culture (the potency of books about animals) affected the science: The scientific community has taken animal welfare to heart and has worked to minimize the number of animals involved in research as well as the animals' levels of suffering. That seems a bit too simple to me. It's not as if scientists (or science fiction writers) are completely isolated from the culture in which they live. That suggests that there is an ongoing dialog between science, literary culture, and popular opinions about science. So how does Kahn suggest public opinion of the life sciences can be improved? Write stories with scientists as heroes, of course. But, if the scientific community wants to engage and inform the public, science fiction is an excellent strategy. Stories captivate people, they survive the test of time, and they become part of the popular culture. So, if any scientists with a creative-writing affinity want to captivate the public and inspire the next generation to pursue careers in science and technology, perhaps they should put pen to paper and start writing. The world needs more stories with scientist-heroes, not more scientist-villains. I find it kind of tiresome when this suggestion is trotted out again and again. It's not that I think that positive depictions of science and scientists in science fiction aren't a good thing. It's that heroic portrayals of science and scientists already exist. Of course when science and scientists are positively portrayed, it often just blends into the background. Take, for example, the Star Trek universe, which is so firmly entrenched in popular culture that even people who don't consider themselves science fiction fans are familiar with it. The future according to Star Trek is a (mostly) happy place to live, in large part because of advanced technology available to the masses: protein resequencers and genetic resequencers help provide food, tissue and organ regenerators are routine medical treatments and the medical lab on the Enterprise can whip up biomolecules on demand. So Star Trek is chock-full of advanced biotechnology that's portrayed positively, and the medical staff . But what examples of biotech are people most likely to remember? Probably Khan Noonian Singh, sworn enemy of Captain Kirk and epitome of human genetic engineering gone wrong. Conflict is memorable. I do think that immoral or amoral scientific research is often unfairly portrayed as a source of evil in popular culture. But I'm not sure that writing stories with the specific aim of positively portraying science is the answer. Fiction written with the purpose of advancing a particular point of view often isn't particularly entertaining. I've put down more than one novel or turned the channel when a story seemed to be overly heavy-handed in promoting a particular cause. So what's my solution? I'd suggest science fiction versions of shows like CSI or House where science is used to fight crime or treat rare medical conditions. And considering that the science portrayed on both House and CSI is speculative enough that that they might already be considered to be dipping their toes in the pool of science fiction, I don't think that it would be too great a leap to create fully science fictional versions, where genetic engineering or cloning saves the day. I'd watch a show like that! Download Mary Shelley's Frankenstein for free: Project Gutenberg, Google eBooks, or for theKindle version from Amazon.com . Top image: still from the documentary Experiments in the Revival of Organisms (1940). 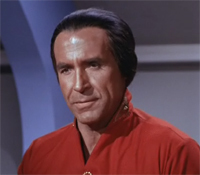 Bottom image: Khan Noonian Singh from Star Trek: TOS episode "Space Seed"
I have to say that I have enjoyed your blogs and I hope that one day mine, SciFi: Write or Wrong, will be as interesting as yours. As for the scientists being depicted as heroes or villains, I think we're overlooking something more important. There is a kind of basic morality tale in many science fiction stories and that is the danger of hubris. Even in movies based on Mary Shelby's Frankenstein, the scientist isn't so much villainous as he is arrogant. The hubris to think that we know everything or can control everything is a dangerous aphrodisiac. From Flat Liners to Aliens the basis of the real story is that, even scientist are human. Whether we’re trying to control death and the after-life for the betterment of mankind or the dangerous alien whose biochemistry we want to use for monetary gain, it’s the idea that nothing is beyond our control. This is a concept that the serious scientists in the story are against and usually give warnings to the more impetuous scientists about the proper use of the scientific method, hypothesizing and testing before jumping in with both feet. Perhaps Lauren Kahn is misreading the stories and mistaking this distinction as a general statement against scientists. My suggestion to Lauren is to reread the science fiction to look for the heart of the matter. I think you are right that arrogance rather than villainy is more common in the depiction of "mad" scientists. For some including me, believe it or not, sci-fiction means living in a fantasy world. This could cause some problems sometimes.